How can the Celtics put the stops on Giannis Antetokounmpo? 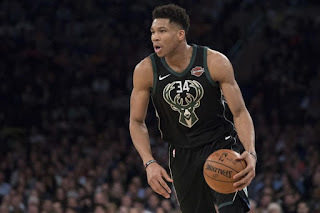 Milwaukee Bucks do-everything wing Giannis Antetokounpo is certainly not the whole Bucks team, but he is a vital part of it. He is their best player by far and in the discussion for NBA Most Valuable Player. When Boston faces Milwaukee on Sunday, they need to find a way to slow him down. Much of that responsibility rests on the shoulders of Al Horford. Al has the size, mobility and defensive skills to stay in front of Giannis when he launches his attack on the basket. The Greek Freak and his team are most dangerous when they manage to steal the ball or deflect a pass, leading to a transition fast break. Other than lacking a 3-point shot, Antetokounmpo has it all. Size, length, athleticism, strength, quickness, speed and supreme talent. He is one of the very few NBA players that, if called upon, could play any of the five positions on the court. Other Than Al, other Celtics players will need to step in. Semi Ojeleye has one of the widest defensive stances I can recall and does a nice job on the Greek Freak down low, as seen in the video below. The entire Milwaukee team is dangerous in transition, but Giannis makes them much more so. When they are on the move, they can seem almost impossible to stop. The second video demonstrates that. So the formula for slowing the Greek Freak down sounds pretty basic. Don't turn the ball over, thereby allowing him to take off in transition. Keep him away from the basket where he does most of his damage. And finally, stay between him and the basket when he is motoring to the hoop. Easier said than done - right, Al Horford.